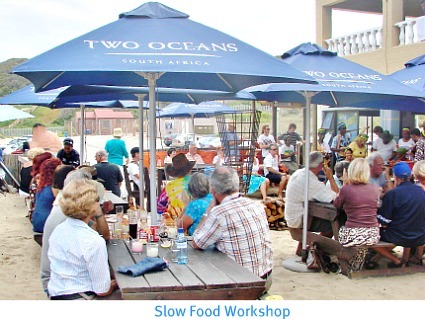 A Caribbean theme Slow Food Workshop took place at PiliPili Beach Bar that teamed up with 22° East restaurant to host Sedgefield's first Slow Food meeting of 2012. A pleasantly cool sea breeze was blowing as the workshop convened outdoors under shady umbrellas next to Myoli beach. It was the ideal venue for the Caribbean theme event and 50 people, members and guests combined, attended the lunch. PiliPili’s owner, Neels told us that PiliPili has a culinary connection in that the name is derived from something known as the ‘Devil’s Chilli" but because PiriPiri was unpronouncable in that area, people used to say PiliPili. 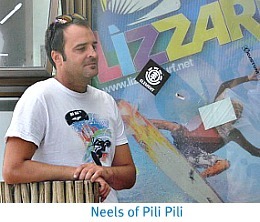 Neels has owned PiliPili for 3 years and the bar is run alongside the Exteme Sports experiences that the company provides. " But, it’s not just extreme sports" he says. "They offer moderate activities as well ranging from surging at the river mouth and local walks to bird-watching." PiliPili Beach Bar kicked off the Caribbean theme day by giving all the diners delicious Jamaican Rum based cocktails. Neels said they are the biggest sellers of Sailor Jerry Rum in the Western Cape. When sampled by itself it has undertones of cinnamon, nutmeg and vanilla with a touch of toasted toffee - delectable!! Neels donated a bottle as first prize in the raffle that was drawn at the end of the afternoon. 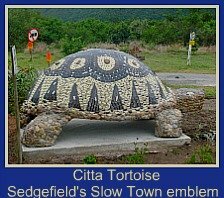 Rhodesian born, world travelled Cathi King gleaned a lot in the two years she spent travelling overseas. Experiences as diverse as a boat stint in Norway to a kibuttz in Israel, all added to the knowledge she's gained and brings to the table at 22° East Restaurant she has run at Myoli Beach for nearly 2 years. Back from overseas and whilst on a holiday in George 6 years ago, she impulsively applied for a job at Monks in Wilderness. As time went by she worked in various other restaurants until she saw in an advert that the restaurant next to PiliPili Beach Bar was available to rent. She decided to accept the challenge of running her own restaurant and hasn’t looked back. 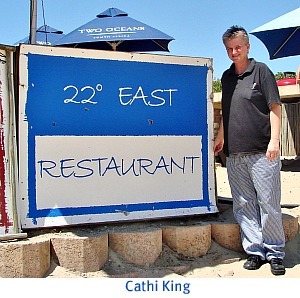 22° East offers all the regular fish and meat dishes. The Seafood snack basket Cathi says is a big hit and her ribs have gained an excellent reputation. In December she added a pizza oven to her kitchen that has proved so popular it quickly paid for itself. Sink your toes into the sand whilst enjoying a tasty pizza and a colourful cocktail from the bar! The workshop wouldn’t have had a true Caribbean theme without Reggae music and something Rasta! Jamaican born Bob Marley (Feb 1945 –May 1981) was a big proponent and revered performer of Reggae music. Entwined with the Rasta Movement that arose in the 1930’s also in Jamaica where its black population were 98% the descendants of slaves, he popularised reggae to the extent that the music and the movement has spread throughout the world. 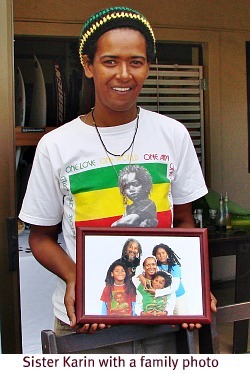 The Rasta movement is regarded by many of its followers as more of an ideology than an organised religion. Many of its adherents worship Haile Selassie I, deceased Emperor of Ethiopia who ruled between 1930 and 1974. Most like to say it’s “a way of life.” They have always advocated (correctly it would seem) that Africa is the cradle of mankind. To support the Caribbean theme, Colin Capon had invited Rastafarian, Sister Karin from Concordia, Knysna to tell us a bit about Rastafarians. There is a community of around 25 families in Judas Square in Knysna. There are township tours that include visits to the Square. Sister Karin briefly explained that Rastafarians have their own culture and beliefs. They eat more fresh fruit and vegetables that in most instances they grow themselves, instead of tinned and processed foods bought in supermarkets. The vegetables are flavoured with spices like cumin, cloves and paprika. Salt is not favoured but pasta, cheese and fish may also be included in their diet. Rastafarians are not necessarily vegetarians. Karin's husband is an herbalist who has been treating people with herbal remedies for some 30 years. 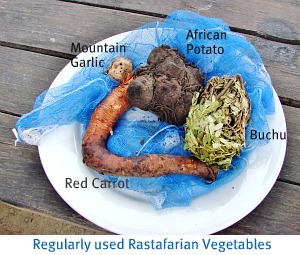 Sister Karin had brought along some rather unusual vegetables that Rastafarians commonly eat – Buchu – often drunk as a tea, mountain garlic, African potato and red carrot – quite different from the regular ones we’re used to. She said that they are good natural antibiotics and combined with cannabis leaf, an excellent painkiller! Sister Karin runs a catering business called Sister S Kos that supplies food for parties and gatherings and operates some food stalls. This supports the Rainbow Community Project that she manages. It is an early child development programme which monitors crèches i.e. checks they are registered, have toilets, fencing (secure areas for playing), a children’s programme and that teachers have the required training. She then looks to provide support in whatever areas a particular creche might be lacking. 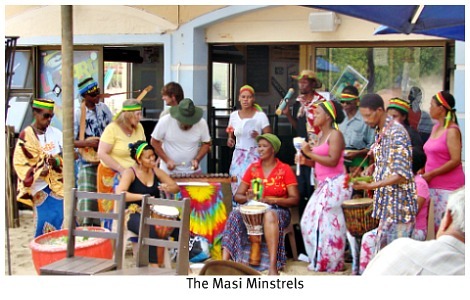 Just before the Caribbean theme lunch the Masi Minstrels co-ordinated by Patricia from Masithandane arrived to serenade us with some Reggae music. 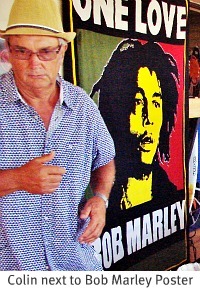 Buffalo Soldier, One Love and Let’s get Together rang out cheerfully with a flare for the rhythm and dance. 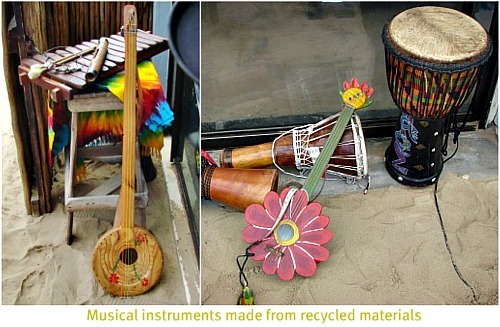 The Minstrels won first prize in a competition a while ago when they recycled waste to create musical instruments. Not only do the instruments work but they also look very attractive. 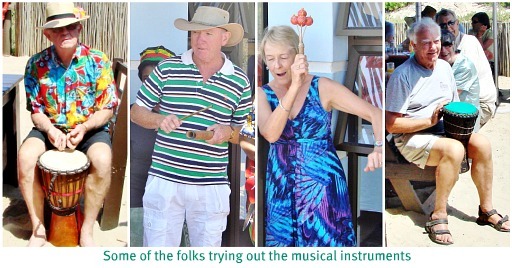 Later the diners had an opportunity to try them out and play along with the minstrels which participators and audience enjoyed. Caribbean Theme Fare is served. All tucked in to the lunch that followed. Chef Colin produced a mouth-watering hors d’oeuvre, Carribean style Kabeljou in a mango sweet and sour marinade. Then there was Jerk Chicken with mango and cocoanut, Island Salad with a creamy yoghurt dressing, Green Leaf Salad, Jamaican Chicken and Pineapple, Caribbean Spiced Chicken and Broccoli, Baked Stuffed Sweet Potato, Pork and Garlic and Cathi’s signature dish which many folk said they’d come back for, Calypso Chicken with caramelised pineapple and yoghurt sauce. For dessert there was fresh fruit salad Caribbean style and chocolate mousse. It turned out to be a perfect day for the Caribbean Theme workshop. Thank you to our hosts Neels and Cathi. Well done to all the foodie contributors and those who work behind the scenes and Colin our hard working Slow Food Co-ordinator and Chef Extraordinaire! 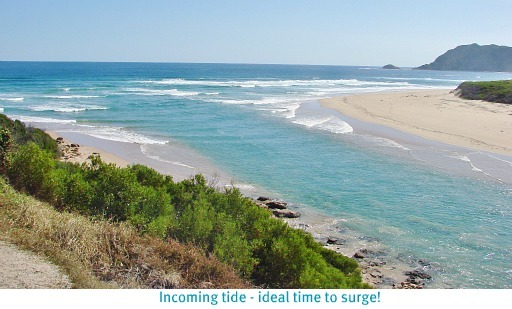 As I went home via Kingfisher Drive, I stopped at the river mouth and watched the tide coming in. The water looked beautiful! No one was enjoying it but it looked perfect for surging. That means walking out into the water as close to the sea as you can until you can’t stand, then letting the tide carry you in as far as you want to go before climbing out on one side to walk back and do it again. Beware its addictive!!! WARNING: If you're new at it and not sure of what you're doing BEWARE - the sea is DANGEROUS! 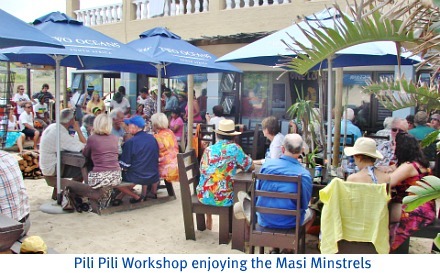 Rather go along to PiliPili at Myoli Beach and let them show you when and how to do it!